Use the included FilePatcher program to patch your savegames or working files (java >= 1.6 needed). if your plugin adds a script, you will have to resave it in the CS after patching. Amazing work, worsas. New data additions should now follow the new file naming system, yes? Of course. We'll use this now instead of PC_Data. FYI: I just had to upload the data files once more, because a goblet model was missing. Nothing big, but if you come across some missing goblets, make sure to download it again. And now I also uploaded the HD-version. Link is in the opening post. Both are full datas, except that the textures in the HD-version have the full resolution. Now that it's here, it'd be great to have this uploaded to Nexus, with proper description including FAQ etc and teasing screenshots from all three projects. Not saying you should do it, worsas, just thinking out loud. In fact a brainstorming for such description might be due. A release thread on Bethsoft would be nice too, to explain any doubts and encourage people to try and use data for themselves and eventually join the projects. If this is going to be distributed, perhaps a .txt file with the necessary words about permissions and non-distribution of models wouldn't go amiss. I'm currently not sure about one certain thing: If people want to unpack something from the bsa and use it in their own mod, they will have to inquire for permission, I agree. Now what if an external mod wanted to include Tamriel_Data.esm as dependency and use its assets as-is? I would not mind such a thing at all, since we'd be automatically credited for our work. But it would be usage of our assets, still. I wonder if it would be legitimate to treat this case differently, though. TR lets people use their data freely and it's a nice platform for people to be creative. Well, I'm not an asset developer, so I don't really have much authority to make a call here, but to me releasing unified data as a "resource platform" free to use by a community, as long as their third-party mods are dependent on it is a no-brainer, really. Heck, I have some ideas for mods utilising it myself, so I'd appreciate that personally. Grabbing an asset out of bsa or even exporting it to another game is entirely different case, and I believe it should remain in an individual asset maker's gesture. That credits file you were working on, expanded to contain modelers' wills, would be a vital part of released Tamriel_Data. I don't have any problems with making our assets freely available for third-party mods. In fact, I thought we already had this kind of arrangement. We'll have to change our container ids due to the extremely limiting game mechanics behind container instances in savegames. Actually, it would have been foreseeable that there is a reason to the 24 letter limits for containers and creatures in the CS. So it's to a large part my fault that we have this problem now. In any case, we'll have to patch our content files again in close future. Sorry everyone. Man, that's a lot of trouble. I hate to add extra work on top of this, but I have to say that the books list is particularly difficult to parse right now. Perhaps a province or thematic prefix would be appropriate? The book ids already hardly fit into the letter limit. A thematic abbreviation would be quite helpful for interior modders, surely. I just hate the thought of going through all those book ids again, apart from the fact that I'd have to look into the books themselves. it might help a lot if we could cut down on copies of the same book for different provinces. Though for most of them this would probably entail repositioning. Hey, aren't Skyrim's wooden pottery amiss in data? After I unplugged SHotN bsa everything else seemse to be on spot, but these models are missing. The good thing about removing the duplicates would be that there would be no longer duplicate skillbooks and no longer discrepancies between the values of different books, but the amount of needed repositioning would be rather majestic, especially for SHOTN. I'm not sure if this additional effort (we are speaking about repositioning almost every single book placed within SHOTN) wouldn't really outweigh the advantages, especially now since we are so close to finishing this data move and I only hope to be finally done with it all. Keep in mind, interior creators should look into the texts of the books they place around anyway. Vanilla books don't come with categorizations either, so having to check the content of the book before placing it is not necessarily a new requirement introduced by these data files. From an idealized point of view, however, I agree that these duplicates are silly. Though values can be adapted to each other relatively quickly, while fixing hundreds of book instances isn't that easy. Did you register TR_Data.bsa? TR has modifed the wooden kitchenware, so we are using their versions instead of ours in the new data files. On a more positive aspect of this container problem: We would have run into the problem of truncated container ids in savegames with our previous data files anyway and we wouldn't have had a solution for the problem without the software that has been developed for this data move now. So we are turning our defect container ids in the old data files into working ones with the new data and fixing a grave problem we didn't know about before. I post this updated Tamriel_Data.esp to ask for your confirmation. I hope you are fine with the new ids. I have no problem with it at all - container names are just next to ids, and model paths just a little bit further, so it's easy to put two and two together. I never got to know by heart what each ID looks like in-game anyway and always tried them out until I found the one I was looking for, so this new naming-scheme is just as fine with me as any other. Edit: hey, when did we get the boar creature? It somehow skipped my notice. cool to have it, too. Just curious, is there a specific reason for Chest not to be "Ch"? I don't mind it too much either way. Just doesn't seem as intuitive for me personally. Ch seems better than Cs indeed. I will change it. Many of our assets were created for exclusive usage by province mods by their creators. 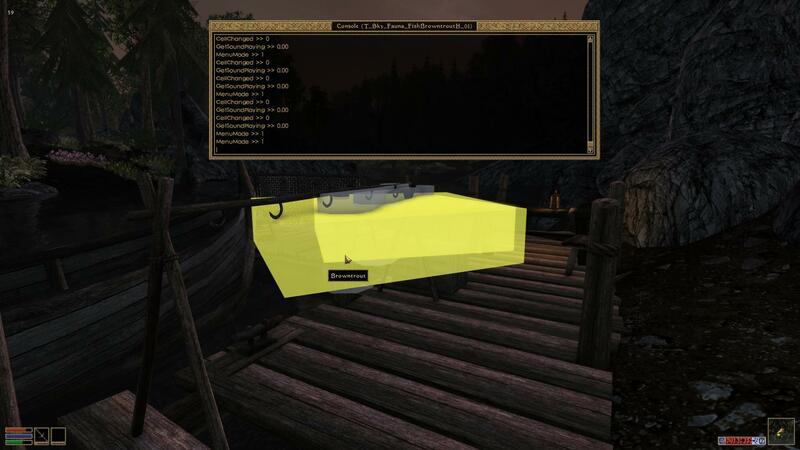 So make sure to contact us at http://project-tamriel.com" onclick="window.open(this.href);return false; first, if you wish to unpack something from PT_Data.bsa to use it in your own work. That way we can check, if the objects you are interested in, are available for usage outside of our own projects. If you are granted usage of the objects in question, make sure the original creators are duly credited for them. However, if you are prepared to add Tamriel_Data.esm as dependency to your mod and use PT_Data.bsa as-is for your project, there will be no such obligation. If you wish to do this, don't reupload our data files to your own modpage, but ask downloaders to get Tamriel_Data from our own download mirrors. In this case there will be no need to credit us separately. That sounds good to me worsas. Found a couple of missing meshes yesterday in testing. In addition the goblets you re-added the meshes for, appear to be missing inventory icons. I can make a more exhaustive list if you don't have one already. The missing icons about the wooden kitchenware have been noticed. I have actually switched TRs versions for ours in the data I'm currently working on, since the latter had no icons and no values assigned to them altogether. I don't know why it's missing the static fish models for you. They are definitely included in PT_Data.bsa. Did you register it in your Morrowind.ini? The new Tamriel_Data is up again with all fixes and additions. Get it from one of the links in the OP. if you have previously patched your working files, use the below-included Translation.txt instead of the one from the data archive to re-patch them to the new container ids. I hope we are finally done with the data move now. Hurray! Thank you for your continued endeavours, worsas. I can't imagine how much work this was. Thanks very much. Updated the opening post with links to the new version of Tamriel_Data. - Overwrote the current orange moss with a larger version. Turned it into a container plant with an ingredient. - Added saddled versions of the Cyrodillic horses and one more color variant. The black horse has been recolored. - Added a set of ancient colovian bronze tableware for Colovian Barrows. - Added old withered wooden chests for Colovian Barrows. - Added a proper dockset for Anvil, Stirk and the gold coast. - Added a further reman mural. - Changed the material settings of the imperial wayshrines. - Changed the statues of the imperial divines so they match each other in size. - Changed gold coast rock textures so they have mipmaps. - Changed an expensive chandelier used for imperial homes. Wonderful work, worsas. Thank you.